2 Behold, a leper came to him1 and worshiped2 him, saying, “Lord, if you want to, you can make me clean.”3¯4 3 Jesus stretched out his hand,5 and touched him, saying, “I want to. Be made clean.” Immediately6 his leprosy was cleansed. 40 A leper came to him, begging him, kneeling down to him, and saying to him, “If you want to, you can make me clean.” 41 Being moved with compassion,8 he stretched out his hand, and touched him, and said to him, “I want to. Be made clean.” 42 When he had said this, immediately the leprosy departed from him, and he was made clean. 43 He strictly warned him, and immediately sent him out, 44 and said to him, “See you say nothing to anybody, but go show yourself to the priest, and offer for your cleansing the things which Moses commanded, for a testimony to them.” 45 But he went out, and began to proclaim it much, and to spread about the matter, so that Jesus could no more openly enter into a city, but was outside in desert places. People came to him from everywhere. 15 But the report concerning him spread much more, and great multitudes came together to hear, and to be healed by him of their infirmities.11 16 But he withdrew himself into the desert, and prayed. How might our perspective of what God wants and what he’s able to do affect the way we approach Him in prayer, worship, and service? In the midst of serving in ministry, has your prayer life become stronger or less frequent? What is stopping you from being His witness, sharing your testimony of what God is (and has) done in your life? Pray for one another’s healing, well-being, and ministry. Learning Objectives: obedience, compassion toward others, Character of Christ, healing, God’s will, gratitude, testimony, prayer in success, no shame, ask, worship, reverence. 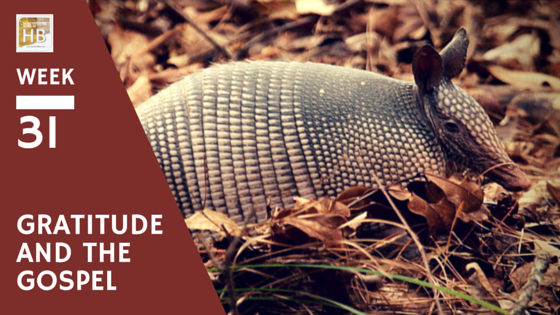 Image: An armadillo seen in a land preserve in Orlando, FL. 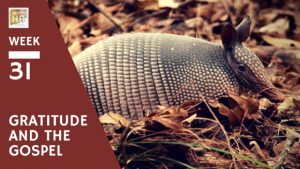 In America leprosy is most often transmitted by contact or consumption of armadillos. Jesus was in one of the towns along the Sea of Galilee. The leper would have been out of contact with the others. Leprosy in the Bible (lepros, Strongs G3015) can also refer to other sorts of skin diseases. Healing is a nicety, not a necessity. The man’s worship (humble submission) and cooperation with Jesus’ mission is much more important. The Gospel stories of healing however ought to allow us to confidently come to Jesus in faith and prayer to ask him for healing. This can be done with others or alone. There is no healing recipe evident in the Scriptures. When one’s prayers are not answered, press on doing the ministry to which God has called you (see Paul’s life and prayer (2Cor 12:8). Another viewpoint is that the man was asking to be “declared clean” speaking to Jesus as a priest (apodosis). Even if this is the case Jesus does what he can, and heals the man of his disease. Not in every case did Jesus lay hands on people. This mounts onto the evidence there there is no due process or incantation to heal people. This is the first time that Matthew uses the word immediately. Mark uses it often to show Jesus’ authority and power to his Roman audience. When/If a leper was healed, he had to be declared clean by the priest who would examine the person and then offer a sacrifice. The person would then be required to wash their clothes, shave, and bathe. Still after all that the person was supposed to wait outside the city walls for another week, and then wash again. At that time the priest inspect the person once more, and make atonement for the person (See Lev. 14:1-32). Here’s an example of Jesus humanity, kind-hearted nature and concern for our human condition and emotional wellness. “Lord if you want”- notice how the man came to Jesus, honored/regarded him with the title ‘Lord’. In his question he begins by recognizing the ‘will of God’. The will of God is an important aspect when asking for healing and other aid from God. As in the Lord’s Prayer we are to subject ourselves to the will of God which may not be our wealth and happiness but most certainly includes the wholeness of spirit. He was to show himself to the priests (Leviticus 14:1-32) so that: 1) they would know that a healing took place and they had no part in making it happen, 2) to fulfill the Mosaic law which is still in effect as the new covenant is being revealed/unveiled by the Messiah, and 3) perhaps most importantly, to help them see the fulfillment of prophecy about the Messiah who would come and heal. Luke sees the results of the man’s testimony as a positive and stresses again the importance of prayer in the life of Christ.